Once the sodium cyanide molecules have done their important job of lixiviating the gold or silver from the ore, some level of residual cyanide will remain in the mine’s effluent and tailings. At Cyanco we have developed a number of proprietary technologies to help destroy and detoxify this residual cyanide and offer these technologies to our customers to keep their operations safe and compliant. Cyanco has extensive experience with the precipitation of heavy metals, such as copper, mercury and lead. Mine effluents often contain these metals, which may need to be removed prior to discharge to the environment. After cyanide destruction, most of the metals are precipitated as metal hydroxides. However, other metal precipitation agents, may need to be used. Cyanco will conduct a comprehensive assessment of each customer’s process and recommend an appropriate solution. With current regulations and industrial standards, like those from the EU and ICMI, requiring industries to monitor cyanide concentration in the effluents in terms of “Weak Acid Dissociable Cyanide” (CNWAD), new methodologies must be considered beyond the standard “Free Cyanide” (CNF) titrations that are commonly used for analysis and control. In order to accomplish this, Cyanco developed the Oxitrol® on-line CNWAD analyzer to accurately measure CNWAD concentration in a treatment circuit, and allow for control of the reagents addition required for cyanide detoxification of the effluents. The Cyanco Oxitrol® patented analytical system can measure and monitor the cyanide ion, CN- , and the cyanide complexes of Cu, Ni, Zn, Cd, Ag, among other species that collectively are referred to as Weak Acid Dissociable Cyanide (CNWAD). Cyanco will install the Oxitrol® unit and train all personnel, with refresher training available upon request of customer. All units are designed and built based on each customer’s application. The Oxitrol® can precisely analyze CNWAD in the effluent samples before or after treatment. Quick, accurate and repeatable analytical results are produced. It is possible to use the system on slurry samples with the included filtration system. This system results can be used as part of a reagent addition control strategy for cyanide detoxification, thereby reducing treatment costs by avoiding overdosing. 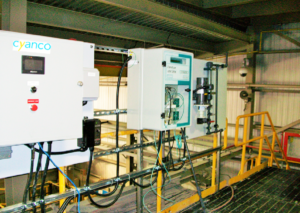 The system monitors the effluent treatment circuit to ensure compliance with treatment regulations, such as the International Cyanide Management Code and other regulations. The system minimizes the need for manual sample analyses thereby reducing turn-around times. This further contributes to the potential savings by reducing manpower costs. generator or our Cyanco High Yield “Cold” Caro’s acid generator. The “Hot” and “Cold” technologies differ by the amount of H2SO5 yielded from the reactants, and is effected by controlling the temperature during and after the reaction. The “Cold” generator produces a higher concentration H2SO5 solution than the “Hot” generator. Depending on the customer’s process, either a “Hot” or “Cold” Caro’s acid generator will be recommended by Cyanco. Caro’s acid works extremely well for destroying cyanide in slurries. 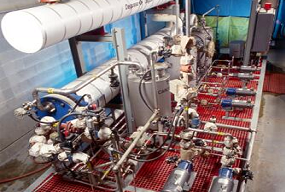 need for large costly reaction vessels. Both feedstock materials, sulfuric acid and peroxide, are readily available worldwide.